↑ "Diseases that are genetically associated with ZFHX3 view/edit references on wikidata". ↑ Morinaga T, Yasuda H, Hashimoto T, Higashio K, Tamaoki T (Dec 1991). 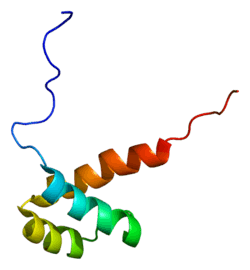 "A human alpha-fetoprotein enhancer-binding protein, ATBF1, contains four homeodomains and seventeen zinc fingers". Mol Cell Biol. 11 (12): 6041–9. PMC 361769 . PMID 1719379. ↑ Miura Y, Tam T, Ido A, Morinaga T, Miki T, Hashimoto T, Tamaoki T (Dec 1995). "Cloning and characterization of an ATBF1 isoform that expresses in a neuronal differentiation-dependent manner". J Biol Chem. 270 (45): 26840–8. doi:10.1074/jbc.270.45.26840. PMID 7592926. ↑ "Entrez Gene: ATBF1 AT-binding transcription factor 1". Bedford MT, Chan DC, Leder P (1997). "FBP WW domains and the Abl SH3 domain bind to a specific class of proline-rich ligands". EMBO J. 16 (9): 2376–83. doi:10.1093/emboj/16.9.2376. PMC 1169838 . PMID 9171351.